Researchers In Colombia Try To Determine If Zika Virus Is Linked To Guillain-Barre Syndrome Is the virus somehow linked to Guillain-Barre syndrome, which can cause temporary paralysis? Researchers are searching for the answer. 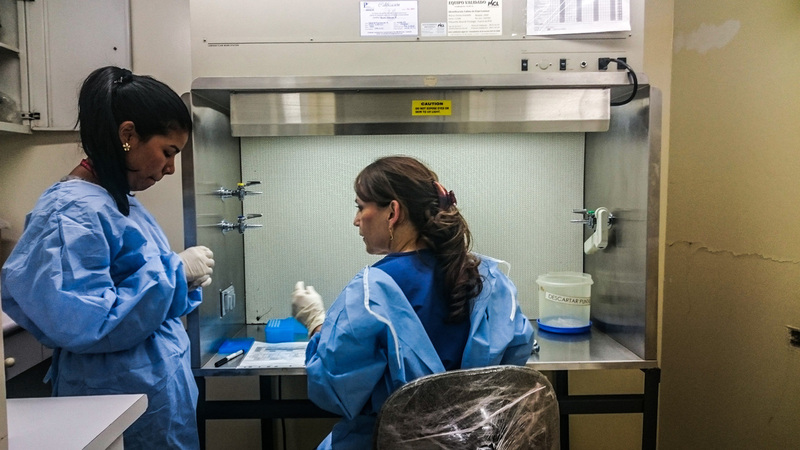 Researcher Beatriz Parra Patino (right) prepares to test the blood and urine of patients with Guillain-Barre syndrome to see if they had Zika virus as well. She's been working seven days a week, up to 14 hours a day, to test samples as quickly as possible. They're simply test tubes, mainly filled with blood and saliva, but to researcher Beatriz Parra Patino, they're a lot more. To her, each tube represents "a human being." And the blood and saliva may hold the answer to one of the many mysteries about the Zika virus sweeping through her native Colombia: Is it linked to Guillan-Barre syndrome, a neurological condition with excruciating effects, including temporary paralysis. "I treat the tubes as if I was treating the person," she says, "with respect and trying to do my best." Parra works in a laboratory at the Universidad del Valle in the Colombian city of Cali. She is part of an international effort with a Colombian connection, stretching to Johns Hopkins University School of Medicine in Baltimore and then back to Colombia. Scientists don't even know all the conditions the virus may be causing — and they've been racing to figure that out. At her lab, Parra has been working seven days a week to prove the link between Zika and Guillain-Barre. The syndrome occurs when person's immune system starts attacking their nerve cells, causing temporary paralysis. People can lose the ability to walk, to smile, even to breathe. We get a sense of just how bad it can get at the Erasmo Meoz teaching hospital, one of the medical centers that is sending these fluid samples to Parra. It's located about 400 miles on the other side of Colombia, in a city called Cucuta - an area with a lot of Zika cases. 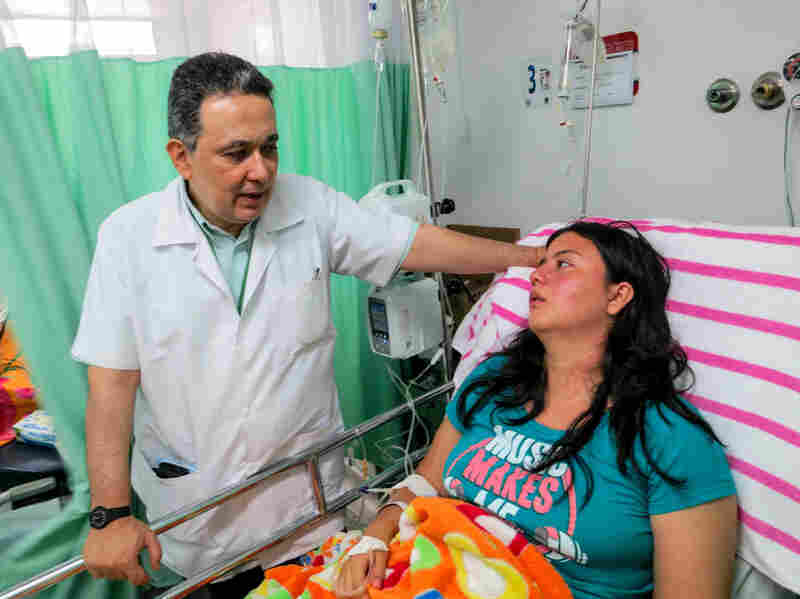 The 25-year-old woman has Guillain-Barre syndrome and is hospitalized in Cucuta, Colombia. Dr. Jairo Lizarazo will collect samples from the patient to send to a lab in Cali, hoping to prove a link to the Zika virus. The head of neurology, Dr. Jairo Lizarazo, is visiting some of his latest Guillain-Barre patients. "One of them is a young doctor," he says, "one of my own students." He finds Dr. Karina Luque collapsed in her hospital bed. Her face muscles are so stiff she has a hard time speaking. "When I sit up, or when I talk a lot I have to stop for a while," she says, haltingly, "because I get really tired." Lizarazo pulls back a curtain to reveal another patient, an older woman hooked up to breathing tubes. "She's been on a ventilator for several days already. ... This is our most serious case." Guillain-Barre is usually rare. At this hospital Lizarzo sees about a half dozen cases a year. But he says, since the Zika outbreak started, "every one or two days we get a new case." It's a pattern not just across Colombia but in four other countries where Zika is spreading in a big way. Which is where Dr. Carlos Pardo, an expert on neurology and neuro-immunology, comes in. He's a professor at Johns Hopkins University School of Medicine in Baltimore. But he's originally from Colombia. And earlier this year, he says, "I got a call from one of my colleagues in Colombia who was telling me about this unusual outbreak of cases of Guillain Barre. I immediately made the connection that this may be related with Zika." He moved fast to set up a study — getting not just Dr. Lizarazo but doctors at four other hospitals in Colombia to collect fluid samples — bood, saliva, urine and spinal fluid — from their Guillain-Barre patients. Pardo wants to analyze the antibodies these patients have produced because he thinks that at the same time that those antibodies are fighting the virus they're also latching on to nerve cells that have a component that looks Zika. "So in other words, the immune attack is confusing elements of the nervous system." But that's just a theory. First Pardo and his collaborators need to prove something more basic. They need to show these Guillain-Barre patients really did have Zika. A large share of them report experiencing symptoms consistent with Zika about two or three weeks before they came down with Guillain-Barre. But proving it poses some challenges. For instance, one of the usual quick ways to check if someone has had a virus is to checking their blood for antibodies to that virus. You essentially drop a bit of Zika virus into the blood sample and see if antibodies in the blood react to it. But that's complicated in the case of Zika because antibodies for the virus tend to cross react with similar viruses that many people in Colombia have already been exposed to – dengue and Chikungunya, for instance. So a positive antibody test for Zika could actually just mean the person had dengue. Another option is to check the person's blood for the presence of the Zika virus itself. Here again there's an obstacle: Zika virus can only be found in the blood during an active infection. But there's a potential solution. Research suggests Zika might linger longer in other body fluids such as urine, saliva and spinal fluid. Which brings us back to researcher Beatriz Parra Patino at that lab in Cali. She's testing not just blood but all those other fluids. Pardo knew Parra from his medical school days in Colombia. "Carlos just called me and said Hey! What are we going to do with this. What is the plan!" Pardo arranged for funding to buy Parra the ingredients to do the testing. She's measuring them out with a pipette now, getting ready to drop them into the test tubes with the patient samples. "I'm going to be quiet because I need to concentrate on putting in the samples," she says. Then Parra pops the tray of tubes into a machine that will run them through various temperature cycles. The results will be ready in two hours. Thanks to this extraordinary mobilization of research, proving the Zika connection to Guillain-Barre — at least in a preliminary way — could take just a few more weeks.